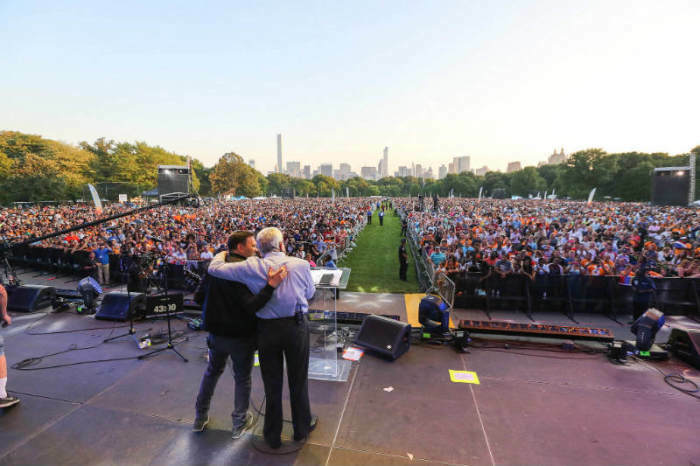 NEW YORK — Thousands of people flocked to New York City's iconic Central Park on Saturday, to sway to the sweet sounds of Matt Redman and Mandisa and to have their hearts pricked by the preaching of Argentinian evangelist Luis Palau. They stood for hours in defiance of the burdensome heat, leaned against gray metal railings and lay sprawled out on towels on the brilliant green grass. Some watched from yards away, eyeing the giant screens above and on either side of the stage while amplifiers carried melodies from Hezekiah Walker, Marcos Witt and Chris Tomlin through the air. Others got as close as they could to the stage. Although it was closest to the stage that the sun seemed most brazen and should have been causing the most misery, the people there looked more elated than annoyed — apparently too caught up with the music or the messages for something as trivial as the sun to bother them. According to Ingrid Ayala, a volunteer who offered to pray with attendees after Palau preached his message, she noticed, "A lot of people were touched. I saw a lot of people crying in the front." But before they cried, they danced and leaped in the air, raising their hands and voices while singing along with Israel Hougton's "You Are Good," and other popular contemporary Christian and gospel songs. 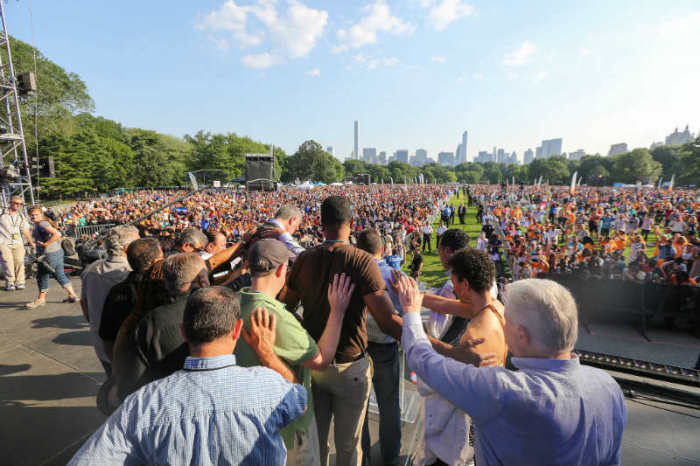 They came from the Bronx and Brooklyn, Long Island and New Jersey, and there was a couple that even flew in from Panama to volunteer as spiritual counselors for NY CityFest, the name of the gathering on Central Park's Great Lawn on Saturday. The unusual event was organized in celebration of what 1,700 local churches have been doing over the last year to help meet the needs of their communities through service projects and school partnerships. The Central Park CityFest, the last of three such major gatherings held this past week, was headlined by Palau, dubbed by some as the "Latino Billy Graham," and featured remarks by former Yankees pitcher Mariano Rivera, whose wife pastors a church in New Rochelle. Other musical guests included Argentinian rock band Rescate and TobyMac. 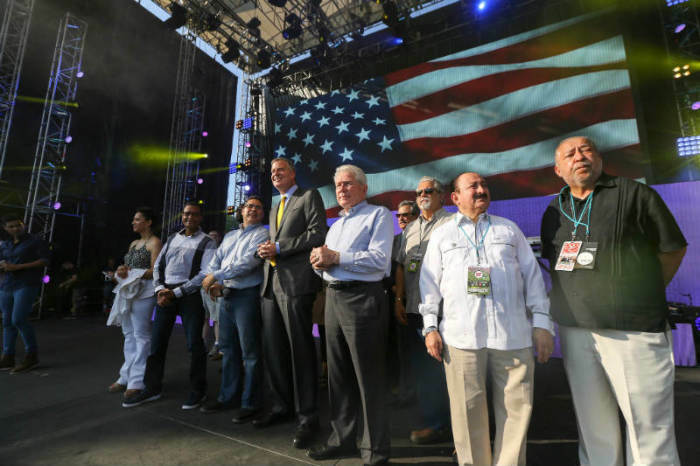 New York City Mayor Bill de Blasio also appeared on stage, where he was prayed for by Palau and several local pastors who oversee the CityServe "movement," as organizers prefer to call the $10 million-budgeted, three-year campaign. The 4 p.m.-10 p.m. Central Park event, like the ones at Radio City Music Hall and at Times Square, was free and open to the general public.